It’s almost the time of year for Star Wars fans, nerds, geeks, and crazies to all gather in one place for one of the best showcases in the galaxy. 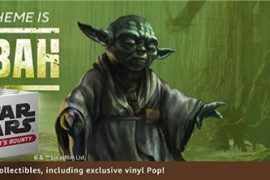 Yes, Star Wars Celebration 2019 is right around the corner, and as of today, we have the official word from Disney and Lucasfilm concerning the special guests list. At the top of the guest list this year is the newest member of the Chewbacca club, Joonas Suotamo. Joonas took over full time Chewbacca duties as of The Last Jedi, but played the most physically arduous side of the role in The Force Awakens while original Chewy actor Peter Mayhew bid adieu to the character with some of the light on the feet work. The other big name included in the announcement is none of than the voice of Darth Maul and Starkiller himself, Sam Witwer. Witwer voiced the hate filled Sith Lord Darth Maul in Star Wars: The Clone Wars, Star Wars Rebels, and most recently in Solo: A Star Wars Story, and if we reach back to a time when new Star Wars games were being made relatively frequently, Witwer voiced the star character, Galen Marek aka Starkiller, in the Force Unleashed games. A true Star Wars fan and all around good dude. Rounding out the guests are a host of other Star Wars personalities including JJ Abrams’ best buddy Greg Grunberg, Greg Proops, Dave Chapman, Ian McElhinney, Ori Shoshan, and Paul Kasey. Look at that thing of beauty. 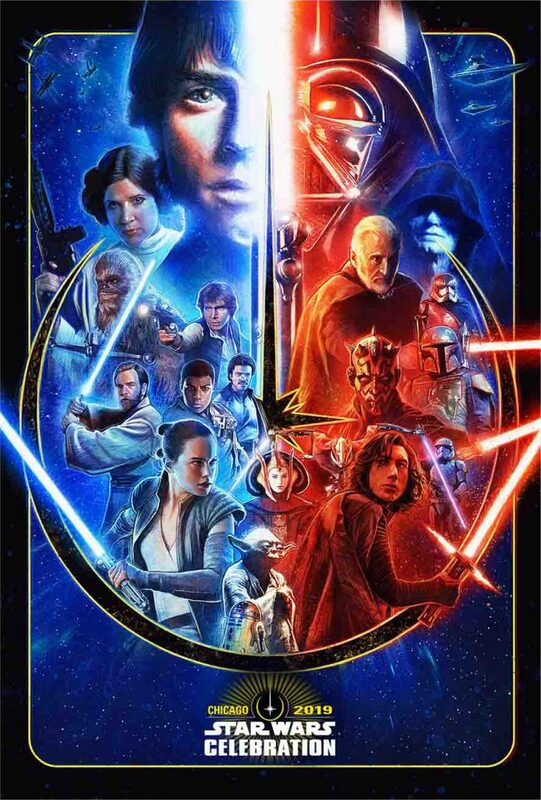 This is the official Star Wars Celebration 2019 poster, and it is a doozy. A true showcase of dark and light from all eras of the film trilogy, and may I say, a true Celebration of all things Star Wars. Matt and I will be live on site at Celebration 2019 and we are going to give you as much inside access as we possibly can, so stay tuned to our social channels for all the updates once the party starts!